How Airports Are Changing The Retail Senario In India? Today the major airports of the country have substantial area devoted to retail. Perfume, cosmetics and destination merchandise are the largest-selling items at the departure section of the Delhi airport. Indian airports have come a long way since catering only to the business of flying passengers. Airport infrastructure in India has taken a quantum leap in the major metros, post the advent of private operators. The international standard of infrastructure brought about in the airport terminals of the metropolitan cities in the recent years has now led them to catch up with global airports both in the ‘look and feel’ department as well as with the trend of promoting airports as key retail hubs. Airports in major cities such as Mumbai, New Delhi, Bangalore, and Hyderabad today have been revamped from being dull, uninteresting places to more vibrant, lively and effervescent destinations. The transformation primarily happened with the privatisation of airports, led by operators such as the GVK Group and GMR Group, resulting in private-public partnerships. Small, gloomy airport retail areas turned into glitzy shopping lounges and with people having high disposable incomes frequenting them, sales here are outperforming conventional retail markets and high street shops.Thus, airport retailing appears poised for an impressive growth in India. Today, airport retailing offers such business opportunity as no retailer can ignore. In the Indian context, till a few years back the idea of duty-free shopping at airports largely comprised purchasing cheaper liquor or foreign chocolates and perfumes. Thanks to the emergence of the concept of airport retail in India, this no longer holds true. The new age discerning traveller has been recognized as a serious consumer of goods and his tastes are being indulged in every possible way. This has further pushed forth the concept of airport retailing. This new phenomenon has already gained acceptance across the world and India is on its way to cash in on this new concept as well. A number of factors have been responsible for the development of airport retailing in India. In recent years, passenger traffic has gone up exponentially with a number of low-cost airlines emerging on the scene, thereby giving way to a large captive consumer base right at the airport itself, seven days a week. Besides, the time spent by passengers at airports has increased due to early check-in times set by airlines owing to security and operational concerns, providing them with the opportunity to visit retail stores. Maximum shopping is done by people in the window between clearing the security-immigration desks and boarding the aircraft. Thus, it made sense for the retailers to be present in an airport, more so since there is a shortage of quality retail space with high visibility in India. Further, factors such as evolving consumer attitudes, attractive real estate, conducive regulatory environment, economic environment and the overall ecosystem have fueled its growth. This has increased retail opportunities; thereby leading airports to develop retail as an integral part of operations rather than pushing the segment away in low-visibility corners. Besides the scope of revenue, retailers today have recognised that airports offer multiple branding opportunities - it is a powerful platform to address a diverse range of clients. While the challenge rests in the fact that retail space is considerably expensive in an airport, which makes it difficult for many to invest in, brands would still prefer to be located in one owing to the high scope of branding exercises. Despite the expensive proposition, the success of this concept holds much significance to the retail sector. This is because, if it is effective in the forthcoming periods, airport retailing will have added another avenue for retailers and investors alike to invest in it as a profitable venture. In a short span of time, airports in India are fast turning out to be one of the most promising sectors for retail development. In present times, almost every premium brand in various segments is keen to establish its presence in the airport's retail zone. As a result, every kind of retailer is involved in the retail of goods in the airport in order to cater to the passengers’ needs - there is something for everyone to indulge in an airport today, right from writing instruments to smartphones to leather accessories. Product categories in the major airports include a varied range of luggage brands, apparel and accessories, besides other categories, which elucidates high sensitivity and appeal to the target consumer. Specialty food and destination souvenirs are other sought-after segments. On the retail format front, the concept of anchor stores, similar to the ones in malls, is expected to attract crowds on a daily basis. This pull-factor is necessary to produce a critical mass for shopping, impacting the overall retail scenario in the airports. An important facet that has emerged in the recent months is that the sale per square metre for several retailer is higher at airports than at other stores located either in a mall or on a high street.This holds true for some of the biggest names with chains of stores across India. This comes as no surprise as airports are high-traffic areas, generally consisting of people with relatively high purchasing power. Product categories such as fast-moving accessories and other high-margin goods have a scope of performing well in these modern airports.Retailers, thus, find setting up shops at airports a great business opportunity. From the consumers’ perspective, airport retailing made good sense as well. Airports, which had traditionally been functioning as transit places, have evolved as self-sustained retail comes with premium brands adorning the shelves, keeping in mind the shopping behavior of travellers.Regarding consumer behavior, airports have proven to be good catchment areas for male shoppers, who otherwise are typified as not willing to go shopping for products. It has been observed that their favourite buys largely comprise electronics, watches, pens, and bags. Airport terminals, thus, has been doubling up as shopping malls that cater to a section of on-the-go travellers who would not have the time or inclination to shop otherwise. From a broader perspective, the affluent Indian traveller today is well-informed about global shopping trends and is open to shopping for high-end items such as tablets and smartphones at airports. For the business traveller who travels late at nights, or catches an early morning flight, the convenience offered by retail stores in the airport benefits him greatly as he may not have time to move around the city for his purchasing needs. Some of the key brands with a presence at Indian airports are Croma, Shoppers Stop, Hidesign, William Penn, Pavers England and WH Smith, among a host of others. A comprehensive tour around the lounges and the sports bars would allow one to realise the quantum of comfort being added for the traveller now. Facilities and amenities such as five-star style lounges, state-of-the-art business centres, multiplexes, spas, health clubs, fine dining experience are all offered to the traveller at the airport. Not surprisingly, most successful retail chains have strategically positioned many of their offerings in the duty-free section.This strategic positioning is strengthened by the fact that airports are driven by passenger numbers, rather than mall crowd where the rate of conversion is quite low. The fact that some of the latest fashion labels consider the airport as an important avenue to showcase their products, points to airport retailing having undergone a significant metamorphosis for the better. On the customer retention front, retailers largely follow the methods they apply to their customers in their non-airport outlets, which includes initiatives like loyalty programmes, etc.Apart from sales, the retail stores are also a great medium for creating brand equity, owing to better visibility. Moreover, retailers have various store formats, which depends on location, availability of space and other logistics. These formats are meant to optimise returns for a brand.The large stores with sizes in the range of 400-1,200 sqft work well in terms of the brand experience they offer, while the kiosk formats offer fast moving impulse items with low average ticket value.Presently, besides the conventional stores and kiosks, retailers are also exploring newer formats, like retail carts/pop up stores which sell impulse merchandise in the gifting segment like perfumed candles, organic food or health products. Besides the factors mentioned previously that have contributed towards the relative success of airport retailing in India, other critical factors are a retail layout, passenger flow and growth, passenger profile, mix of brands, product categories and marketing activities. Ultimately, it is the right brand and the right merchandise mix required that makes a brand thrive. Generally, product categories such as beauty and personal care, alcohol, and tobacco are known to be popular picks in the duty-free section, while books and stationery are sought after in the duty paid section.Other favoured retail categories at the airport are confectionery, beverages, electronics, watches, footwear and fragrance, all of these offered to the traveller through a mix of good frontage stores and kiosks with high visibility.Retailers also focus on having their best sellers always available at their airport stores as part of their sales strategy. Visual merchandising at the airports is of huge importance in making the brand conspicuous to the busy traveller. It plays a significant role as a product needs to be attention-grabbing and with a strong enough message to create a quicker impact, since its target customer - the traveller, is either in a hurry, impatient or bored at the airport. Visual merchandising is dynamic in nature and retailers carry out changes several times a year at their stores to attract new customers. At airport stores where space is a constraint, they use elements of visual merchandising such as easels and festive props to gain the travellers’ attention. In the current scenario, most major Indian airports are expecting revenue from the retail segment to increase with time. As per early-2015 estimates, retail stores in the Indira Gandhi International Airport at Delhi, which is also the busiest airport in the country, were responsible for almost 62% of its total non-aeronautical revenue of the airport, with a compounded annual growth rate (CAGR) of 33%. Ironically, back in 2004, when the GMR Group was given the task of developing the Delhi airport, retailers did not seem too enthused about the prospect of setting up shops in the airport premises and they had to be much coaxed and incentivised. There were a number of concerns about whether customers would buy the products in a high momentum environment of the airport.Notably, most retailers that chose to enter early are still there and observing a flourishing business. These include the likes of Shoppers Stop, Croma Retail, Ethos Watch Boutiques and Hidesign. 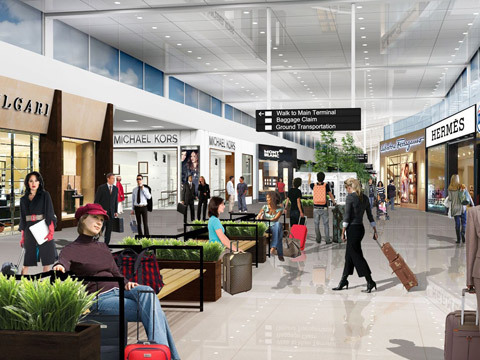 Today, the major airports of the country have a substantial area devoted to retail. Perfume, cosmetics and destination merchandise are the largest-selling items at the departure section of the Delhi airport, while liquor is the largest-selling item in the arrival section.Most of these retailers plan to scale up their operations and are positive about the future endeavours. Meanwhile, Mumbai's Chhatrapati Shivaji International Airport has around 21,000 sq m area in its swanky T2 terminal dedicated to retail, food and beverage, lounge and travel services. In Bangalore, the international airport was the first airport in the country to offer seamless retailing along with the flow of passengers. The airport houses several brands, including a large number of multi-nationals like the Nuance Group, the DFS Group, Alpha Airports Group, Dufry Group and Gebr Heinemann. Several of these brands are duty-free shops. The airport operators today are smart analysts and they strive to strategically align their retail space with the passenger profile, based on their shopping behavior and traffic. The months of December and June are considered to be peak months for passenger traffic, though each has a different passenger profile. December is assessed to be the time when NRIs come to India on personal visits. These are affluent passengers who opt for international variants of chocolates, memorabilia, watches and other expensive gifts. They mostly pick these up in Indian airports than abroad for their relatives as they find it cheaper to shop here. On the other hand, the June traffic is represented by domestic travelers who buy liquor. While things seem to be going hunky dory in the airport retail development scenario, not everything is as rosy as it seems and retail at airports comes with a few big challenges as well. There are areas of shortcomings that need to be overcome. While companies are set to cash in on the vast potential of retailing at airports, the costs of the outlets do not come cheap. Retailers have to pay high rent per square feet for space they occupy at airports and it will be most certainly higher than their stores at malls or in a high street. Generally, on an average, per square feet, rental values at airports are nearly double of what retailers pay at high streets, although revenue sharing arrangement between the airport operators and the brands is also prevalent in some cases.Another area of concern entails that there is always a possibility for private airports to inadvertently go overboard with their retail plans, thus converting their terminals into mega malls.Airports must strike a balance between retail space and passenger facilities. Altogether, high costs remain a predominant factor, along with high risks associated with airport retailing. The costs of operations are higher at airports as the stores need to remain open throughout the day, thereby doubling employee costs. Moreover, getting airport passes and stringent security clearance procedures are inimitable issues that a retailer has to face while operating in airports when compared to malls and high streets. Besides, other deterrence include elaborate security protocol prior to important days and national holidays like Independence and Republic Day, as well as product restrictions and delays in getting merchandise to the stores. The Centre for Asia-Pacific Aviation (CAPA) estimates that the duty-free spend at Indian airports will reach $1.6 billion by 2021 - an eight-fold increase spread across a decade. The collective spend on duty-free, duty-paid and food and beverage is expected to touch $3.5 billion by then. Airport retailing is a popular concept globally but is still in its infancy in India. The non-aeronautical revenue, predominantly from retail, is more than double the aeronautical revenue at most airports abroad.